Art Sensation, Doug Hyde, is taking the art world by storm with his emotionally charged pictures that evoke a wonderful feel good factor. 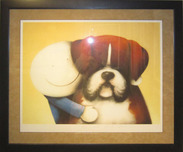 Born in Bristol, England in 1972, Doug Hyde became very aware of his artistic talent at a very young age. Hyde's bold figurative imagery coupled with a vivid, strong color palette is what makes his art so exciting. Doug Hyde's work represents something that is simple yet immediately impactful. Fundamentally it represents a celebration of life, love and happiness that transcends both age and class. Every age group from all walks of life are buying into Doug Hyde's creative feast of optimism and wellbeing. It is art that people can understand and relate to.